Markham Fair is Canada’s largest 4-day fall fair with many entertaining and educational events for all ages. It is always held on the weekend before Thanksgiving. Help us keep our annual tradition going, bring your family and friends and enjoy our “rural heritage”. Located in Markham, Ontario, Canada. (see map) Free Parking. There’s plenty more happening during the Markham Fair, check out the complete Event List. September 27th 9:00 a.m. – 10:00 p.m.
September 30th 9:00 a.m. – 6:00 p.m.
What to See or Do During the Fair? Official Opening, Demolition Derby, Holstein Show, HorsePower Live, Fireworks Display. Tractor and Truck Pull, Light Horse Show, Giant Screen Video Dance, Teen Talent Show, President’s Choice Super Dogs, Two for the Show, HorsePower Live, Fireworks Display. Heavy Horse Show, Light Horses & Ponies Show, Six Horse Hitch, Old Tyme Fiddle Contest, RAM Rodeo Tour, Heavy Horse Pull Competition, Fireworks Display. Markham Fair Light Horse Obstacle Challenge, Children’s Pedal Tractor Pull, Spelling Bee, Meet & Greet with Paw Patrol, Markham Fair Chef Challenge, RAM Rodeo Tour, Motorsports Mania Monster Truck Show Featuring Black Stallion, Higher Education and Overkill Evolution Monster Trucks. Wonderful Wandering Entertainers throughout the grounds including Doug The Great, Silver Elvis, Trulee Odd Show, Kobbler Jay, Hitmen Drumline. Plus… Newborn Farm Animals at Old MacDonald’s Farm, Mooonica the Cow, Face Painting, Live Country & Rock Bands, Concert Bands, Agriculture and Homecraft Displays and Demonstrations including Woodcarving, Licensed Entertainment at Wine and Beer Tents, Midway by World’s Finest Shows, Monster Truck Rides and Faircrow’ s Farm Park. 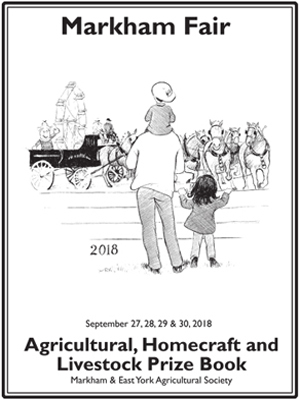 Fabulous Food , Commercial Concessions , Master Gardeners of Ontario, Agri-Food Tent with local food cooking demonstrations and hands on activities. Fireworks after dusk. Markham Fair is an annual event hosted by the Markham and East York Agricultural Society. Originally agricultural societies would meet on a regular basis to discuss various concepts of agricultural improvement such as livestock development and increased grain yields. Often the society would collectively purchase a bull or seed grain, which would be made available to members only. The fall fair would then be an opportunity for the farmers to compete by showing off the fruits of their labour. Due to increased technology and rapid communication, agricultural societies no longer find it necessary to provide this service. The Markham Fair continues to create the forum known as the fall fair.